There’s nothing like a good scented candle to bring a sense of the season to a house. I’ve disappointed many a friend and family member when they’ve walked into the house and thought I was baking something delicious, only to find out it was a candle burning. I can evoke a sense of summer fruit or Christmas cookies and all I need is a lighter. I almost feel guilty. You might recognize the fabric from the tote bag I made for her last year – she loved it. Underneath that wrap is a Lavender Vanilla Yankee candle, which smelled even better than it sounded, but it’s the wrap I want to talk about today. It’s quick to make and it can be moved on to the next jar when this candle is empty. I liked it so much I made myself a Christmas version. Don’t tell Santa. You’ll also need five to nine squares of fabric, either 3” square for the five petal flower or 2” square for the nine petal and a button for the center. Make the flower using the tutorial shown here. Lay the outside piece face up. 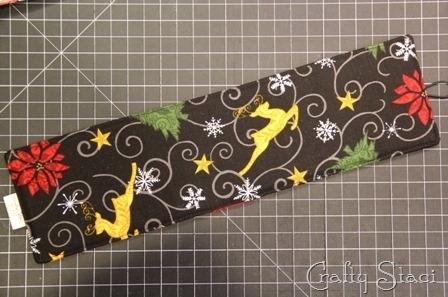 Tie the ends of the elastic together using a piece of thread or zigzag on your sewing machine. Place the elastic in the center of one end with the loop facing in. Add a tag on the other end if you have one. Lay the inside piece over that, right side down. Finish with the batting on top and pin everything in place. Stitch around the outside, 1/4” from the edge, leaving a couple of inches open at the bottom for turning. I always add some extra stitching over the elastic so it doesn’t pop out. Clip the corners, turn right side out and press, turning in the opening. Top stitch all the way around, close to the edge. Loop it around like it will be on the candle with the ends touching and mark the spot where the elastic reaches without stretching. Stitch the button on that spot. Stitch your flower on where ever it looks best on your cozy. 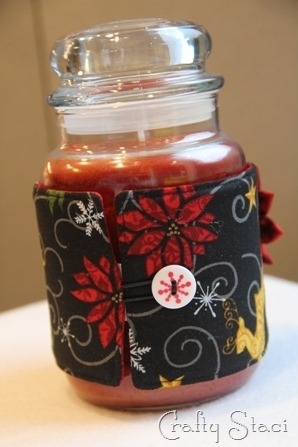 Wrap it around the candle and hook the loop around the button. I made sure this was tall enough to cover the label on most 22 ounce candles. This would make a great gift for a teacher, a neighbor or my grandma. I’ve got her covered, so go ahead and give yours to someone else. I’m pretty sure I’m going to need one of these for every season, just like my candles.